In case you found that this book is not helpful, that it doesn't contain practical advice or that it doesn't contain useful information then you are eligible to request a full refund. You will a get full refund by just emailing me and no questions will be asked. So, you are 100% safe, you will either get the benefit or your money back. By Far, this is the best money making book that was ever written. 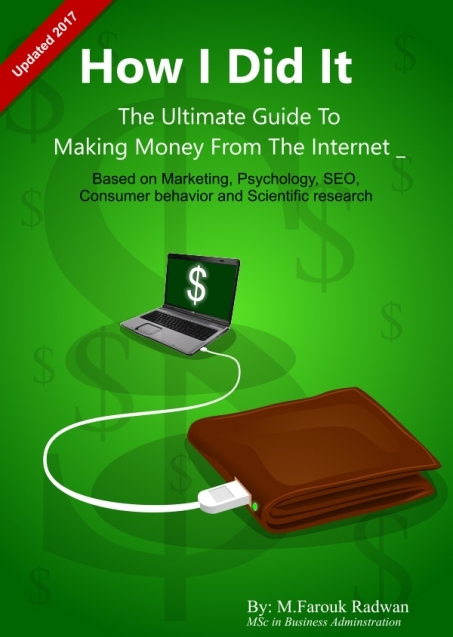 This book is a 100% guarantee that you will be able to make a good amount of money from the internet. If you applied what's written in this book you will get back the money you paid in a short period of time in addition to a good monthly income that will last forever. The book doesn't contain "A system for making money" like the systems other people sell,simply because these systems rarely work but it contains solid and practical knowledge that can help you make money from the internet in a proven way. The book explains every single small detail that i did in order to make a website that generates thousands of dollars/month. I did not spend money advertising for my website nor I have spent hundreds of hours marketing for it, I just followed an approach that if anyone followed will allow them to make the same amount of money. The book starts from the scratch and will tell you how to setup a website in few steps without paying anything. Thanks to free software like WordPress anybody can setup a website in few minutes with the least amount of effort and without paying anything. You don't have to have something to sell simply because by taking advantage of any affiliate program you can sell the products created by other people and still make the same amount of money. You can even sell my products , which are guaranteed to sell, and get 75% commission. Also With Google Adsense you can start making money the same day you bring your website online, this book will tell how to setup a website from scratch and how to run it so that you make thousands of dollars/month without much effort. Once you manage to get traffic to your site you can sell any of the products others created through affiliate programs. The key to making money online is not creating products but rather getting traffic. Once you manage to get traffic you can easily monetize your site in 24 hours. The book will tell you how to do the most important thing to make money online which is "How to get traffic to your website" then it's going to tell you how to monetize this traffic. Not only does the book cover this part ,by starting from the complete beginning, but you will also get the benefit of being able to ask my any questions directly and get a timely response. I will be with you step by step and so you will never get stuck. You will get free consultation worth hundreds of dollars totally for free as long as you want. You don't have to have any credentials for you will sell products created by people who already have those credentials. There are hundreds of thousands of affiliates on the internet who are looking for people like you to promote their products in exchange for a very big commission. In 90% of the cases the commission is above 50% of the sale. 2knowmyself was developed before I have had a single degree and all the degrees that I have now were financed by the money that 2knowmyself brought to me. So the money came first, then the certificates. Its all about the approach I used and not the degrees, you don't have to make a website that contains vital information like mine, you could just make a simple website using the approach that is described in the book and you will still make good money. The approach described in the book doesn't depend on advertising or any other paid method. The book was designed for people who want to have a good income without paying anything or investing any amount of money. Just like you, i am sick of all of those who hype similar products by saying that they are selling the ultimate money making system or the get rich in few weeks book. This book doesn't have the "super proven system" that can make you 30,000$ a week nor does it have the ultimate proven system for becoming a millionaire in few month but instead it contains realistic promises like generating a good monthly income that allows you to work from home. Personally i think that you can generate something Around 5,000 USD/month if you applied the advice in the book properly. Even if you only made 500 USD/month from your website (if you didn't do enough effort) still this will be way higher than the amount of money you initially paid for the book. 1) I Already made it This book does not contain information that I have read somewhere nor does it contain theoretical advice that I believe might work, but instead, it contains the approach that I followed to develop ,from scratch, a website that generates thousands of dollars/month. 3) No nonsense advice I wont tell you content is king, i wont tell you that you must exchange links with other people but i will give you non traditional advice that will work. 1) You will make good money: Simply because you will get your money back in addition to profits. By just applying what's in the book you will be able to bring yourself some good cash in a very short period of time. What a successful investment is it to pay a small amount of money then get a lifetime source of income. 2) Advice that truly works: The book contains all the discoveries that i made regarding what works and what doesn't work in the E-business world. It could take you years to reach the same findings, i am giving them to you in one book right now. 4) Backed by real science: The book contains information that are based on many sciences including marketing, management, psychology,selling skills,website optimization,customer service,e-commerce, research methodology in addition to my practical experience. 5) Step by step and detailed: The approach explained in the book is very simple, straight to the point and very practical. The implementation of the ideas inside the book is going to be a very easy task since every small detail is explained and supported with graphical illustrations, this is not the kind of book where you will find information that couldn't be applied or that aren't practical enough. 6) You will get more than what you paid: Unlike all other books, the money you are going to pay this time is going to be returned back to you if you followed what’s written in the book, in addition to profits. The money you are paying is an investment, and the return on investment is going to be much bigger than the initial amount you will pay. The least thing this book can do for you is bringing you back your money in a short period of time, in addition to some profits. Maybe i am an exception? You might be saying to yourself "But hey, maybe you are just an exception and i may not be able to do the same as you"
This is my third website not the first !! so what i wrote about actually worked three times (each time i tried). I have two other websites one is about the stock market and the other is about making money online. I am only 27 years old (at the time of writing), i am not an old man who has 40 years of experience nor i am a retired business man, i am just as young as you are but i just know an approach that anyone can use to make money successfully. How much money do you expect to pay for a product that will help you generate thousands of dollars? This book sells for only 49 Dollars, in addition to free consultation that actually costs more than 500 but you are are getting it for free. Book structure All what you need from marketing to HTML. No intuitive tricks, No traditional advice and no facts that aren't backed by solid research and real life experience. Price: 39 USD 49 USD. The book's price will definitely increase again simply because i am selling very valuable information for few dollars, the price may bypass 100 dollars in the medium term. All 2knowmyself's money making secrets and inner works are described in this book which makes it very hard for me to sell it at that low price. For every book that '2knowmyself' releases, new versions are always released that contain more pages. The new versions are always sent free of charge to those who bought the old versions. Prices of books increase with the release of new versions, so its always better to buy 2knowmyself's book as soon as they are released. Farouk Radwan is the founder of 2knowmyself.com ,the one who wrote all the 2000+ articles found on the website and the author of all 2knwomyself.com's books. Farouk holds a double major, the first is in engineering and the second is in business administration. Farouk holds many respectful world wide known computer certificates like CCNP,CCIP,MCSE,MCDBA,MCT. Farouk doesn’t only have a business background but he also has a solid IT background that came from working as a network administrator for six years. Farouk is an entrepreneur, stock market investor and MBA holder. In addition to this, farouk is a motivational speaker and trainer, he is studying psychology since he was 17, in addition he is the owner of the company Empowerment (based in Egypt) which is specialized in delivering personal development courses to individuals and corporations. Farouk is a certified NLP practitioner (American board of NLP), certified hypnosis practitioner (American board of hypnosis) and is holding a diploma in behavior therapy and gestalt therapy. Farouk believes in facts that are backed by scientific research rather than Intuitive tricks that can be easily guessed by anyone. Farouk was interviewed and his work was covered by several Egyptian TV channels and popular newspapers like OTV, MBC, El Youm TV, monowa3at TV, Cairo today, International herald turbine and el ahram news paper. Finally and the most important piece of information, Farouk is making thousands of dollars/month out of 2knowmyself.com, if you want to do the same then check out his book, How I did it. The book will be delivered to the email you are going to enter at the purchasing page within 24 hours from making the order. i am pleasured to own this book, this book help me to understand very important concepts in the e-business world and how to take advantage of them. I would like to thank you for your experience that you transferred to me through your book which now helps me find the right direction in the online world. A while ago, I told Farouk that I was interested in the idea of running a business online and was asking him for help on how I can establish one of my own; next thing I know, he sends me the book 'How I did it" to edit!!. This book took forever to edit, simply because all the time I was reading it to get all the information on how I could do it myself, and forgot all about the editing! The book, in a very simple yet meaningful way takes you step by step through the process needed to get your own website running in exactly no time; I couldn’t put it down till I got down all the info needed to get myself up there in the world of website business!